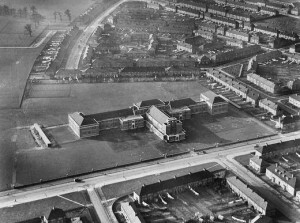 The first school on this site was Dagenham County High School which was finished in 1935. In those days, students had to pass a test in Year Six to go there. In 1970 comprehensive schools were introduced to Barking and Dagenham and several schools, including Dagenham County High, joined together to become Parsloes Manor Comprehensive School. The building we call Lester was added in the 1970s. In 1990 Parsloes Manor was joined by two other schools to become The Sydney Russell School. Roger Leighton became its second Headteacher in 1996. As the school became even more successful and popular, it had to expand and, in 2013 a multi-million pound building programme was completed. There are now five buildings on the site as Kingsley, Durrant and Norris have been added. In 2015, the school became an academy. 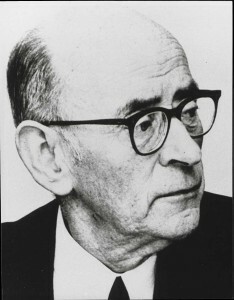 Sydney Russell was a man who did much good work in Dagenham. He was born in 1906 and trained to be a Methodist minister. In 1932, he became Warden of Kingsley Hall, a community centre on Parsloes Avenue. For many years he was also Chairman of Parsloes Manor’s governing body. He died in 1988 and the new school was named in his honour. Our buildings are named after the people who founded Kingsley Hall. Kingsley and Lester were named in honour of Muriel, Doris and Kingsley Lester, members of a wealthy family who set up Kingsley Hall to help the less fortunate. In 1931, Mahatma Gandhi, the man who led the movement to make India independent from the British Empire, stayed at Kingsley Hall. Durrant and Norris were named in honour of Arthur Durrant and Phoebe Norris who were youth workers at Kingsley Hall. In December 1946 they invited Germans who were being held in a prisoner of war camp in Harold Wood to attend a service at the Hall, then have Christmas lunch with local people. In 1948 they invited some teenagers from Witten in Germany to stay with Dagenham families and attend Dagenham County High School for two months. Dagenham has been “twinned” with Witten ever since. The appearance of the school has changed a lot since 1935. We have the largest classrooms of any school in the country; thirty-two computers in each one and in addition to the three floors of I.T. rooms and a sports hall with Olympic standard flooring. Excellent facilities are matched by high quality teaching and pastoral care. Most of our students go to university when they leave school, including to Oxford, Cambridge, London and The London School of Economics, institutions with a world class reputation. Former students have followed careers in law, medicine, business, sport and acting. They include the late film star Dudley Moore and former Archbishop of Canterbury, George Carey. While they were students at Dagenham County High School many years ago, two members of the dance group Diversity attended The Sydney Russell School much more recently. Although the school has undergone many changes since 1935, our values remain the same. Our emphasis is on academic achievement, high standards of behaviour, personal development and recognition of our responsibility to the wider community of Dagenham. Currently, we are the only secondary school in Barking and Dagenham designated as Outstanding by Ofsted. Your child is joining a popular, successful and dynamic school. Encourage him or her to take full advantage of what we have to offer and to contribute to making it even more successful. Our achievements were recognised in July 2015 when the school was visited by Her Majesty the Queen and His Royal Highness the Duke of Edinburgh. The Queen unveiled a plaque and she and the Duke met many students and staff. Lily Hewitt, who was then in Year Seven, presented the Queen with a bouquet.